Raglan Church in Wales VC Primary School is a brand new, 21st Century School built for integrated learning experiences that support every child to develop their skills at their own stage of development, based on large, plaza learning environments. It is an exciting place to work and to learn for us all. 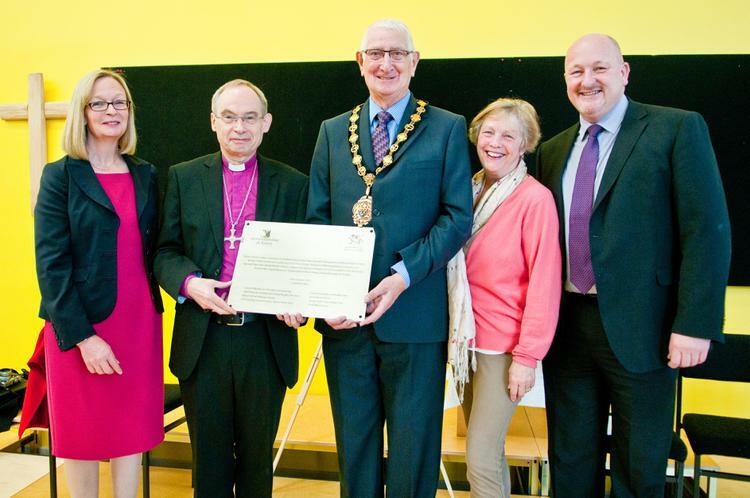 Our new school was blessed and dedicated by Bishop Richard, Bishop of Monmouth on Friday 4th September as a Church in Wales Primary School, and was officially opened on 22nd October, 2015 by Bishop Richard Pain; Brian Strong, Chairman of Monmouthshire County Council; Peter Fox, Leader of the Council; CCllr Liz Hacket-Pain; and Dr Cheryl Morgan, who was our Chair of Governors until September 2016 and led us through the build of our new school. Our school serves a wide rural catchment area with families joining us from within the school's catchment and also from Monmouth and Abergavenny where there has been space in the cohort. We have a capacity for 210 children but currently have 212 children on roll, and more than half of our children travel on school transport each day from rural locations within out catchment area. Our classes are organised into 3 learning plazas - we have a mixed Foundation Phase Plaza - named by the children as 'Orchard Plaza'; a mixed Year 3 and 4 Plaza - 'Apple Tree Plaza'; and a mixed Year 5 and 6 Plaza, called 'Canopy Plaza'. For more information and an overview on plaza-learning and the learning environment, and our approaches to learning please have a look at the documents in our 'Key Information' section. See also our 'School of the Week' article from the South Wales Argus http://www.southwalesargus.co.uk/news/13781942.SCHOOL_OF_THE_WEEK__Raglan_VC_Primary_School/?ref=rss .